On the 7th September, the famous tall ship, Phoenix left Charlestown for the last time. 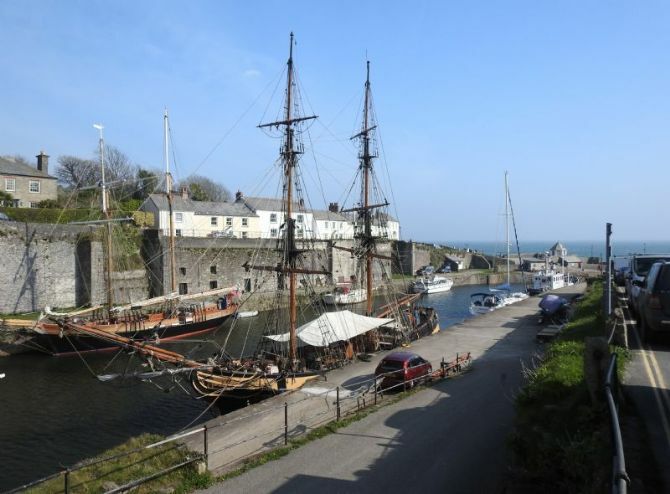 After more than twenty years of calling Charlestown home, the two masted brig known to millions for her starring role in many films and television series has set sail for new horizons. Many of you will have seen her on your visits to Charlestown where she has been an integral part of this historic port. In recent years Phoenix has featured in Poldark, Taboo, Doctor Who and in the Hollywood movie 'In the Heart of the Sea'. Aidan Turner, Tom Hardy, Chris Hemsworth and Jason Mamoa have all trod the boards on the deck of this lovely sailing vessel. "Hundreds of crew have joined her on voyages across the globe and began their sailing careers from our rigging and on our deck. We have sailed to the most unlikely of places in all conditions. All from the unlikely little port of Charlestown. "THANK YOU to the many visitors that came to Charlestown to see us. THANK YOU to all the sailors, shipwrights, sailmakers, riggers, engineers, electricians and helpers that have been keeping her going (and continue to). THANK YOU to the optimists for keeping our clarity in check. THANK YOU to the pessimists for honing our ambition. THANK YOU to the die hards that always turned up to see us safely home again. THANK YOU CHARLESTOWN for being an incredible harbour. We will miss you and we wish you a bright future. The departure has prompted sadness and shock from many people including ourselves. 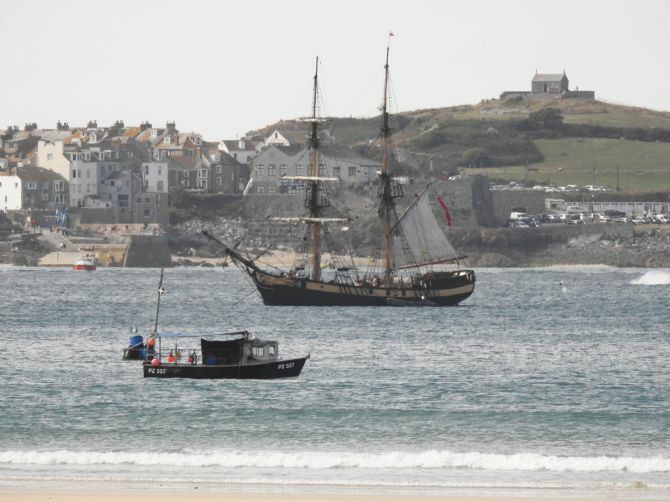 In August 2018, while visiting Porth Kidney Beach at Lelant, we were lucky to see her sailing into St Ives. Phoenix was built in 1929 in Frederikshavn, Denmark. Initially, she worked as an evangelical Mission Schooner and after twenty years retired from missionary work and became a cargo vessel until her engine room was damaged by fire. Originally purchased by Square Sail in 1987, she underwent a first aid over-haul to enable her to sail back to the UK where a full refit was undertaken. In 1991 she was converted to become the 15th century Caravel 'Santa Maria' for Ridley Scott's film '1492 Conquest of Paradise' and stayed in that guise until 1996 when she was converted to the 18th Century Brig we see today. Her departure comes at a time when Charlestown is seeing many changes. In 2016, it's Shipwreck and Heritage Centre was purchased by Sir Tim Smit, co-founder of the Eden Project and earlier this year he approached the former owner of this historic harbour, Shane McCarthy, with an offer for the 23 acre Georgian site. Jeremy Beech, a partner in the specialist property company SBC Property, stated that the site "had not been for sale or marketed but we had an approach from Tim Smit and a deal has been agreed"
Phoenix is now heading for Liverpool and after that who knows where the tides will take her. We wish Phoenix and her crew fair winds, full sails and wonderful adventures as she embarks on her new journey. 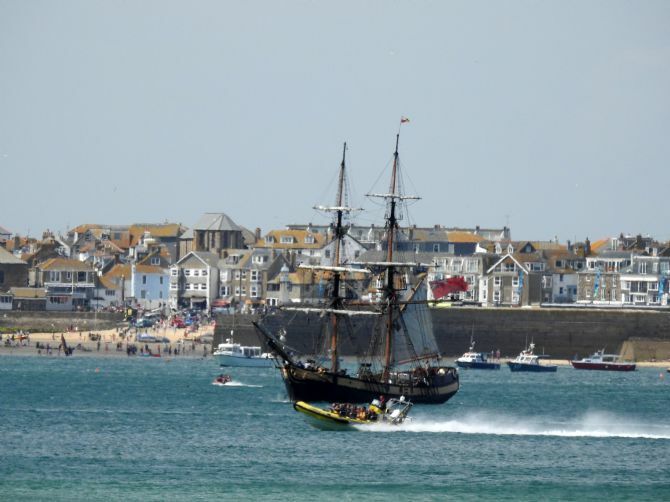 Photographs of Phoenix visiting St Ives August 2018 and at her former home of Charlestown.